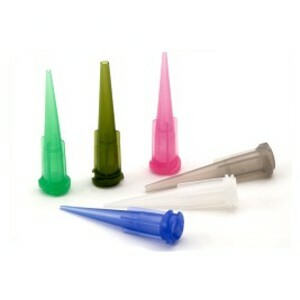 The tapered tip series designed with a double helix threads and universal luer lock to provide secure connection to industrial syringes or dispense valves. The Double Helix TT Series Dispensing Tips are recommended for applications where dispensing medium and high-viscosity fluids with a high degree of precision and consistency is required. A smooth internal fluid path designed reduces turbulence flow, prevents air entrapment and fluid dripping caused by "back pressure" built up. The flash free orifice ensures accurate and repeatable dispensing. And for the first time in the industry, the 27-gauge is available to make micro-dots dispensing possible.